Waking up with no memories, two creatures search for meaning within a magical world that seems to know more about them than they do. Though Ren300 has yet to realize it, she may be the turning point in a war that has raged since the dawn of history. But can she even manage to escape this surreal plateau of biomorphic danger? This shorter comic functions as a looser prequel to the first chapter of Ren300. 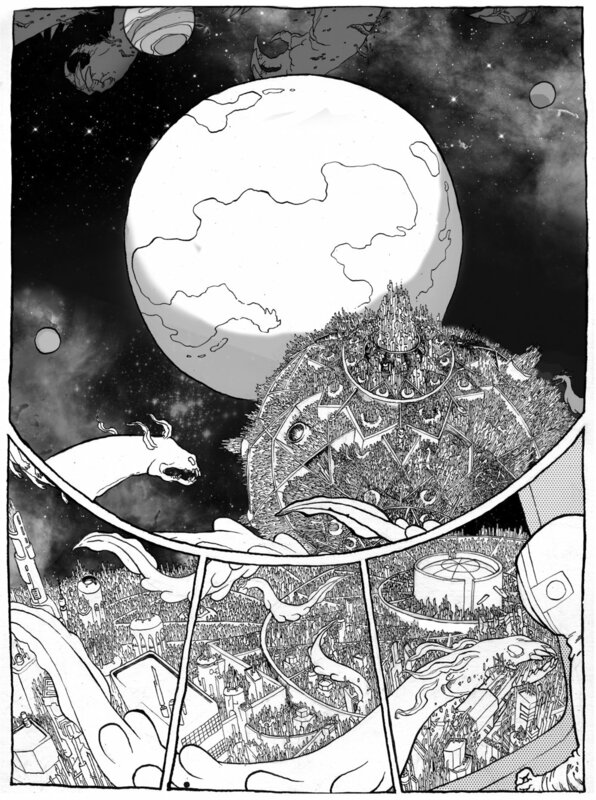 A wordless sci-fi comic featuring giant space tadpoles and astronauts! A 2 page wordless assignment for a sequential arts class at the Maryland Institute College of Art, shown here in color for the first time. The Crashlanders was created as a prequel to Lost Slog almost a year later. A 9-page adaptation of a fascinating and psychotic short story by Francisco Coloane, done for sequential arts class. 10 page personal narrative for sequential arts class. 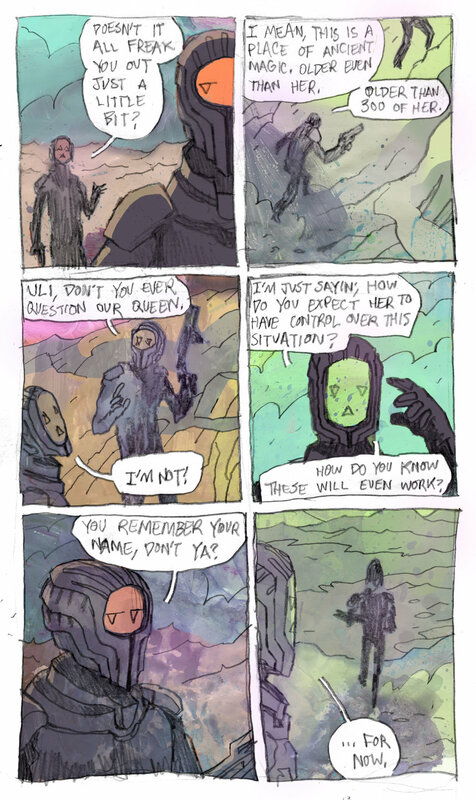 Done for a "personal narrative" assignment in a sequential arts class at MICA. This story was loosely inspired by real-world events that occured during the time the project was assigned. A three layer screen print that doubles as a one-page narrative cartoon. 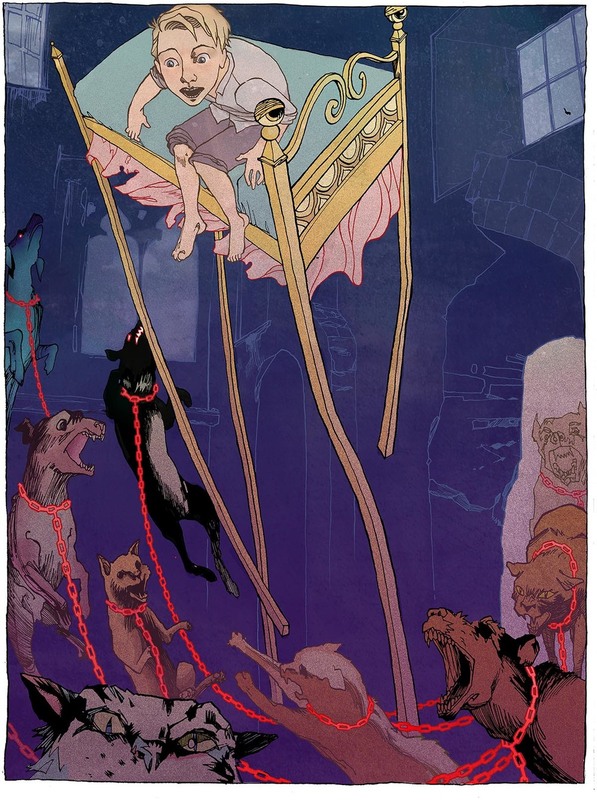 Zi is a fantastical story about a young orphan who is dragged into a world with a dark history and angry hordes of mutant bear rats. "THE BOY WHO WENT FORTH TO LEARN WHAT FEAR WAS"
"'You will soon learn what it is to shudder,' he thought. He secretly went there ahead of him. After the boy had reached the top of the tower, had turned around and was about to take hold of the bell rope, he saw a white figure standing on the steps opposite the sound hole. The sexton thought, 'He can't seriously mean that.' He made not a sound and stood as if he were made of stone. 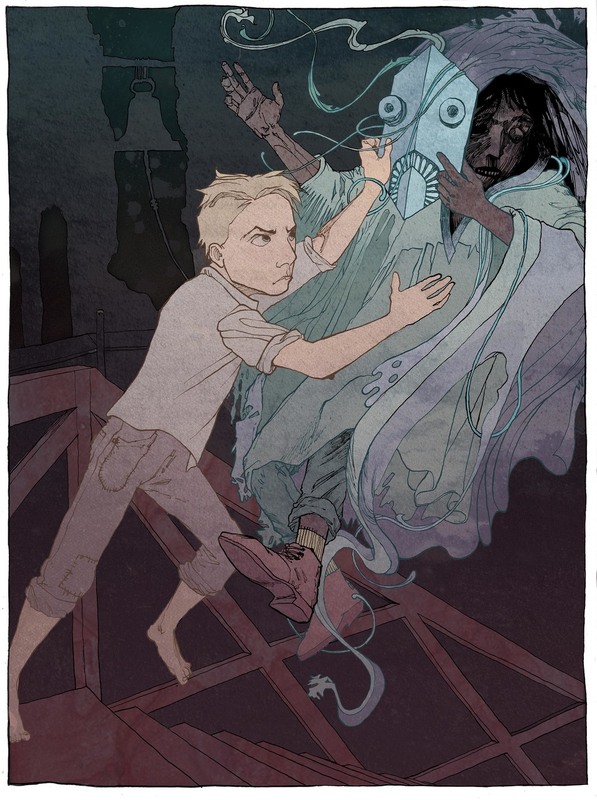 Then the boy shouted to him for the third time, and as that also was to no avail, he ran toward him and pushed the ghost down the stairs. It fell down ten steps and remained lying there in a corner. Then the boy rang the bell, went home, and without saying a word went to bed and fell asleep." "After he had put these two to rest, he was about to sit down again by his fire, when from every side and every corner there came black cats and black dogs on red-hot chains. More and more of them appeared until he could no longer move. They shouted horribly, then jumped into his fire and pulled it apart, trying to put it out..."
"As he thus sat there, his eyes would no longer stay open, and he wanted to fall asleep. Looking around, he saw a large bed in the corner. 'That is just what I wanted,' he said, and lay down in it. However, as he was about to shut his eyes, the bed began to move by itself, going throughout the whole castle. Then the bed rolled on as if six horses were harnessed to it, over thresholds and stairways, up and down. But then suddenly, hop, hop, it tipped upside down and lay on him like a mountain. But he threw the covers and pillows into the air, climbed out, and said, 'Now anyone who wants to may drive.' Then he lay down by his fire, and slept until it was day." "Then a man came in. He was larger than all others, and looked frightful. But he was old and had a long white beard. 'I've got you,' said the monster. Then the old man led him through dark passageways to a blacksmith's forge, took an ax, and with one blow drove one of the anvils into the ground." "'I can do better than that,' said the boy, and went to the other anvil. The old man stood nearby, wanting to look on. His white beard hung down. The boy seized the ax and split the anvil with one blow, wedging the old man's beard in the crack. 'Now I have you,' said the boy. 'Now it is your turn to die.' Then he seized an iron bar and beat the old man until he moaned and begged him to stop, promising that he would give him great riches. The boy pulled out the ax and released him. The old man led him back into the castle, and showed him three chests full of gold in a cellar. Meanwhile it struck twelve, and the spirit disappeared, leaving the boy standing in the dark. 'I can find my own way out,' he said. Feeling around, he found his way to the bedroom, and fell asleep by his fire." A narrative series in which I illustrate the Brother's Grimm fairy tale by the same title. Featuring two full page digital illustrations and two spots, completed in Fall 2015 for a sophomore illustration class at Mica. For the rest of the story, go HERE! For some more out-there narrative based work, check out my series of cross-discipline pieces based on the tale of Marya Morevna.